Deep convection is rapidly developing around a low pressure system southwest of Manzanillo. It appears that this system will become tropical storm Nora overnight tonight. As of 9:00 pm edt / 6:00 pm pdt the tropical disturbance was centered near 17.5° N / 106.5 W or about 170 miles southwest of Manzanillo, Mexico. Top sustained winds are estimated at 35 mph and increasing. It is moving northwest at about 10 mph. Forecasts take this system northwest to west of the Baja over the next several days. 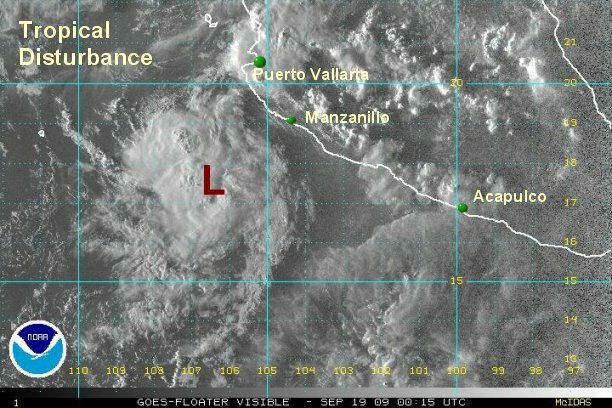 This "tropical disturbance" continues to organize as it pulls away from the western Mexican coast west of Manzanillo. Deep convection is near and mostly north of the circulation center. it appears that the circulation is strong enough for this to be classified as a minimal tropical storm. We'll be conservative and wait until the first visible satellite images come in to declare it a tropical storm though. 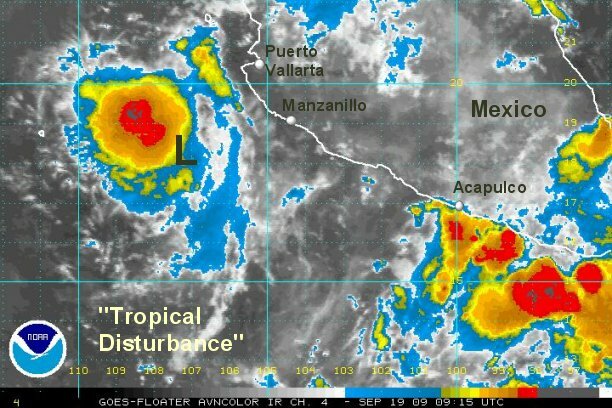 As of 6:00 am edt / 3:00 am pdt the tropical disturbance was centered near 18.3° N / 107.3 W or about 195 miles west southwest of Manzanillo / 375 miles south southeast of Cabo San Lucas. Top sustained winds are estimated at 35 mph and increasing. It is moving northwest at about 10 mph. 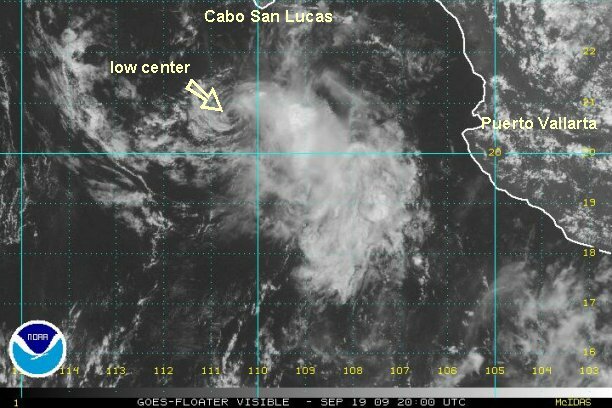 The low center probably was a tropical depression on the verge of becooming a storm earlier today. Wind shear has now picked up and has stripped convection from the center of the low. It may have lost its chance to be classified. No doubt this was a depression earlier. It displayed a solid surface low and deep convection. As of 4:00 pm edt / 1:00 pm pdt the tropical disturbance was centered near 20.8° N / 110.5 W or about 140 miles south southwest of Cabo San Lucas. Top sustained winds are estimated at 25 mph. It is moving northwest at about 15 mph. The convection has been totally stripped from this system. There is little chance of development as the continues west northwest away from Mexico.